A caring funeral home that serves bereaved families in Clermiston, West Edinburgh. Scotmid Funerals at Rannoch Terrace did a fantastic job of organising my brother's funeral on 29 March. Muriel especially was very kind and helpful and took a lot of weight off my shoulders. Even organising the wake. The staff at Forrester were also very helpful when I went down to see Jim in his coffin. I would highly recommend Scotmid Funerals. This is my first time arranging a funeral, which was very daunting. Whilst sad, I was given the best help possible from Muriel Hendry. The compassion and care shown was, and still is whilst awaiting the funeral, second to none. I have been kept up to date with the happenings of the day itself, which is such a great comfort at this sad time. It’s that wee bit of ‘going the extra mile’ that helps families cope and manage to get through this, and Muriel has certainly done that. I would like to thank her on behalf of the whole family as it certainly helps us get through this. Firstly we would like to thank Muriel who done a great service from the first day to the last. She was fantastic. Secondly, everyone at Forrester, Ian, Candice and the rest of the team who looked after us on the day. Ian I felt went above and beyond for me and my family and we could not have got through this without them. I can’t recommend them highly enough. 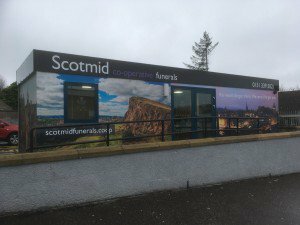 This funeral home in Clermiston is proud to be a part of Scotland’s largest independent co-operative, with a rich history spanning over 150 years. Scotmid is proud to be at the heart of the local communities they serve, our Clermiston office located in the west of Edinburgh. It can be found behind the Drumbrae library hub, next to our Scotmid food store. There is parking available next to the office. Excellent service from Muriel and the team. Very good service from friendly staff. They know their jojoba and are very sympathetic to relatives. Suggestion - following discussions we had a few things to do / tasks and needed to organise. Trouble is because of strain of organising funeral your mind goes blank. If notes from meeting had been printed and given to relatives this would help. Nothing was left for us to do, thus making things a lot easier from the first day we met Muriel. We were made to feel very valued and from the initial enquiry at portobello, the same level of service transferred to Rannoch Terrace. This was coupled with excellent drivers and great care. Not something we want to do too often but if the service given to us is the normal standard, you can be assured that you’ll feel very satisfied. Thank you Muriel and all staff at Scotmid Funeral Directors. Wilma & Martin Clark. Firstly I would like to say a huge thank you to Muriel Hendry for making the whole funeral Arrangement as uncomplicated and stress free as is possible . Muriel was respectful , compassionate and dedicated to every detail involved , which for our family was important. Muriel contacted me at key moments and was never intrusive , even the after care once the funeral was over was thoughtful and respectful . The Forrester funeral director was also comforting and everyone was so professional .All the staff were were so caring and compassionate caring for my late mum and ourselves . I will take this opportunity to thank you all once again . I would like to thank you for a very professional service. The personal service was a comfort to myself and my family. Muriel was amazing can't thank her enough for the help and support she gave me and janemarie. Would like to think of her as a friend now. Received excellent service from Muriel at Scotmid in clermiston who was very helpful and understanding at a very difficult time. Everyone was very helpful and nothing was too much trouble - they made it so easy and stress free. Scotmid Funerals, Clermiston will provide you with a free obituary as part of their service.